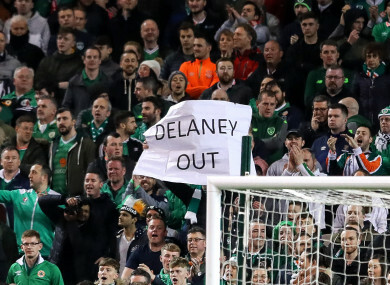 Ireland fans protest over FAI Executive Vice President John Delaney. TENNIS BALLS RAINED down on the Aviva Stadium tonight during the Ireland-Georgia Euro 2020 qualifier, as fans protested as a result of recent revelations in relation to John Delaney and the Football Association of Ireland. The incident took place in the 33rd minute of the match, an apparent reference to former FAI CEO and new Executive Vice-President of the organisation John Delaney’s much-publicised desire for Ireland to be the 33rd team in the 2010 World Cup on the back of their controversial play-off defeat to France. Moments after the balls were cleared from the pitch, Ireland took the lead courtesy of a well-executed Conor Hourihane free kick. The incident drew a mixed reaction from pundits. Speaking on RTÉ, Richie Sadlier said that fans were “angry and disillusioned for legitimate reasons,” though fellow pundits Ronnie Whelan and Damien Duff both described the supporters’ actions as “ridiculous”. Rumours had circulated of a protest in the days prior to the match. “I’ve been at games, I’ve been at Charlton when people have done it”, said McCarthy at his pre-match press conference, when asked for his opinion on the protests. “It’s not going to help us play any better, that’s for sure. So I hope that’s not the case, try and overlook that. “They [the fans] are coming to watch a football match and they want us to win, and to give us the best chance is by getting behind us and not having any outside influences affecting that. Meanwhile, speaking to Sky Sports before the game, James McClean urged fans against such actions. “Throwing tennis balls on the pitch, what does it achieve? “I think it’s pointless and stupid. “You’ve seen it happen a few times in games and I just don’t see the point in it because throwing tennis balls on the pitch isn’t going to get someone to change. A Claire Byrne Live/Amarách Research poll of 1,000 adults yesterday found that seven in 10 people don’t support John Delaney’s continued involvement with the FAI. Email “Tennis balls rain down on the Aviva Stadium in anti-FAI protest”. Feedback on “Tennis balls rain down on the Aviva Stadium in anti-FAI protest”.